A young American woman discovers she may be responsible for attacks on Seoul by a giant monster. Since winning acclaim for his feature debut, 2007's time travel head-melter Time Crimes, Spanish director Nacho Vigalondo has struggled to live up to his early promise. Open Windows had an intriguing premise - a Rear Window style thriller taking place entirely on a laptop screen - but Vigalondo couldn't morph it into a satisfying watch. Extraterrestrial attempted to add a human dimension to the alien invasion genre by concentrating on the plight of one lone couple, but again the movie failed to live up to its premise. With his latest, Colossal, Vigalondo once again attempts to splice large scale sci-fi with indie drama sensibilities, and sadly it's yet another misfire. Since losing her job as a writer for a website - a victim, it's implied of faux social media outrage, an element I wish the film had explored further - Gloria (Anne Hathaway) has been partying hard. Arriving home at dawn after her latest bender, she's shocked to find her long suffering boyfriend Tim (Dan Stevens) has packed her bags, no longer willing to put up with her wild lifestyle. Gloria returns to her hometown and moves into her now empty family home, reuniting with an old friend, Oscar (Jason Sudeikis), who gives her a job as a waitress in her bar. After a post-work night of drinking, Gloria awakes the next afternoon to discover the world is in a panic. Earlier that morning a giant monster materialised out of thin air in downtown Seoul, wreaking havoc for a couple of minutes before disappearing. Gloria discovers that somehow she is connected to the monster, which appears at 8.05am if she walks through a local playground. Colossal's first half will have you thoroughly gripped as Vigalondo manages to sell a premise that could have easily fallen flat from the off. Key to making this outrageous concept believable is Hathaway's performance, arguably the finest work of her career. As evidenced by her star turn in the late Jonathan Demme's Rachel Getting Married, the actress is at her best when playing broken and tormented characters. Of course, Gloria is one of those glamorous Hollywood alcoholics whose make-up never runs and who favours beer over turpentine. She's no more an alcoholic than the average college student. At the midway point, the movie takes a dark turn, and any sense of verisimilitude goes out the window. After so convincingly selling us the sci-fi elements of his plot, Vigalondo fails with the human side, as a character suddenly turns into an over the top, moustache twirling, sociopathic villain who makes Katherine Heigl's evil ex from Unforgettable seem grounded in realism. When reviewing female-oriented romantic comedies I inevitably find myself moaning about how the lead always ends up with a guy she seems completely unsuited and unattracted to, simply because he's a 'nice guy'. Credit to Colossal for attempting to address this issue, with Sudeikis' 'nice guy' here turning out to be a bitter narcissist. The trouble lies in how this is revealed. It comes out of nowhere, with no build up, no foreshadowing, as though 20 minutes of the movie were chopped out of its first act, and I couldn't buy into any of the character's evil actions. A similar problem lies with Gloria's boyfriend Tim, whom the film portrays as a foppish Hugh Grant type and ultimately villainises, despite the fact that he's clearly been put through a rough time by Gloria, whom the film lets off the hook. The whole affair feels as though Vigalondo is more concerned with scoring feminist ally points than in spinning a plausible narrative, and even the staunchest misandrist will struggle to get on board with the film's final act. 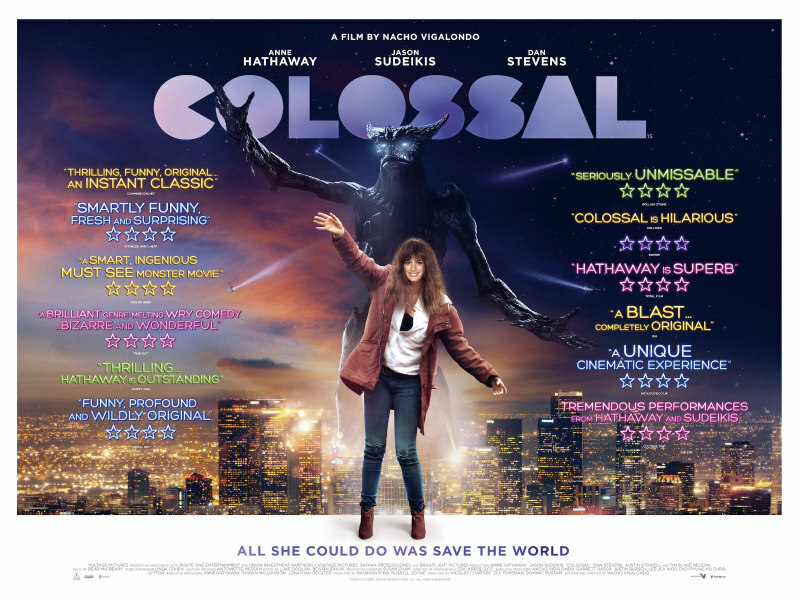 Colossal is in UK/ROI cinemas May 19th.